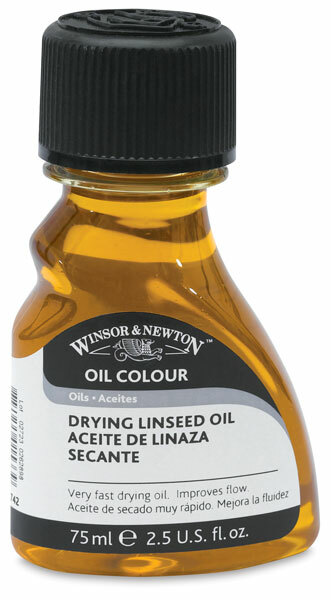 Made with the same vegetable oils used to formulate oil colors — namely linseed, safflower, and poppy — drying oils are used to modify the consistency and drying time of oil paints in much the same way as prepared mediums. 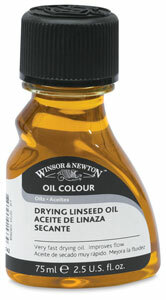 Winsor & Newton Linseed Stand Oil is a pale, viscous oil that can be mixed with turpentine or white (mineral) spirits to improve the flow and leveling of oil colors. It retards drying but imparts a tough, elastic finish. Well-suited for glazing and for fine detail, Linseed Stand Oil is resistant to yellowing while increasing the durability of the film. This is the best oil to use as an additive medium.